Most people think of death as an altogether unthinkable matter, assuming they bother thinking about it at all. It’s a topic to avoid, rarely if ever worth broaching either in company or alone, and should it surface in conversation, it must necessarily surface in brief. Seriously, ask yourself in earnest just how frequently you ponder mortality. 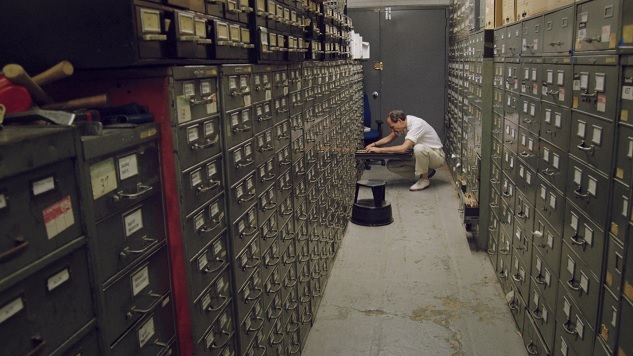 On the one hand, it’s perfectly healthy to consider such things, and on the other hand you absolutely must do so, in order to engage with Vanessa Gould’s new film, Obit, a documentary set among the cubicles of The New York Times’ team of obituaries writers and editors. If you can’t handle frank and often colorful conversations about kicking the bucket, you probably can’t handle this movie. In a manner of speaking, Obit isn’t for the squeamish, especially as Gould arrives at its final sobering talking head sequence: Bruce Weber, a former obituaries writer at the paper, sits at his desk, looks dead-on into Gould’s camera, and tells her audience that, “There’s nothing you can do about dying, by the way. Thought I might point that out.” He chuckles softly, then moves his gaze away from the lens and glances around the room, his lips twisting uncomfortably at his own implicit acknowledgment of that awful, universal truth echoed in pop culture, ranging from the discography of Type O Negative, to the blood-soaked medieval theatrics of HBO’s Game of Thrones. Everything dies. You can ignore that reality but you can’t escape it, whether you’re a movie star, a musician, a burlesque dancer, a political lion, or a humble newspaper columnist. But a funny thing happens when you spend your days chronicling the end of life for a living. Your perspective morphs, it elasticizes, it opens up your concept of what it means to die, and in so doing lends you a new outlook on what it means to live. You might assume that archiving the passing of society’s movers and shakers is a pretty bum gig, but Obit invites viewers to consider the opposite: That in fact by commemorating the dead on the page, we gain vital and even fresh insights into the value of existence, of human ambition, aspiration, and achievement. The film does what so many of us balk at doing when confronted with death. It sees life’s finale as an opportunity for celebration, a chance to embrace a person’s accomplishments during their allotted time on Earth, rather than solely as tragedy. Gould isn’t heartless, and neither are her participants: A spirited cast of characters tied to the Times’ obituaries desk, either in the present or past tense, including William McDonald, Margalit Fox, William Grimes, Jack Kadden, Peter Keepnews, Douglas Martin, and of course the previously mentioned Weber, among others, each of them practically buoyant with curiosity, driven by the urge to uncover all that they can about their subjects as their deadlines rush to meet them. There are mentions of mourning, because it’s impossible to talk about death sans the natural reflex of grief, but from Obit’s viewpoint death is the moment where we must honor life. You can learn a lot about a person after they shuffle off their mortal coil, assuming that you read papers staffed by ultra-competent obituary writers. There’s more to the film than that, of course: Shop talk is a major component to Gould’s work, in-depth discussions of what goes into penning an obituary, how assignments are decided, and why, oh why, so many high-profile obits happen to highlight white dudes. (Fox, one of Gould’s most well-spoken and arresting speakers, has a comprehensive answer to this innately troubling query, though if you’re a good enough sleuth you can probably figure it out on your own. If you can’t, well, just watch the movie.) Unsurprisingly, the people possessed of the most notoriety or the highest profiles are prioritized over the rest: Pages flip by the screen, displaying names like Bowie and Ferraro, Williams and Henderson, Stritch and Hoffman, Mandela, Moore, and countless others. They’re names we know, attached to icons we worship on a cultural level. When we’re not marveling at the breadth of deceased titans covered by Gould’s film alone, we’re down in the Times news archives with Jeff Roth, the mortician to the paper’s morgue, poring over clips stored and preserved with care, decades’ worth of data and stories called upon as needed in the pursuit of probing the past; we also spend a great deal of time just watching the writers and editors ply their trade, picking up the phone to speak with relatives for the sake of fact checking. It isn’t thrilling, but it is lively, which may be the most wildly incongruous word for describing a documentary about the art of composing a worthy obituary. Yet Obit is exactly that, lively, a nimbly made movie that benefits from its subjects’ inherent appeal, as well as their profound sense of compassion. “Death came with friendly care,” Samuel Taylor Coleridge wrote in “Epitaph on an Infant,” but back then Death didn’t have the Times’ crew of obit journalists working his beat.